1840 Ames NCO Sword is crafted with the same specifications as swords carried by the US Military for over 70 years including during the Mexican War, American Civil War and the Spanish American War. These noncommissioned officer sabers feature a single edged blade with AMES MFG CO / CHICOPEE / MASS engraved onto the left ricasso and US / DFM / 1863 engraved onto the right ricasso. The 31 ¾ inch high carbon steel blade features a lengthy, broad fuller. The whole hilt is crafted of cast brass and features a ribbed grip. These swords have a global pommel with capstan. Still popular today, the 1840 Ames NCO Swords have a kidney-shaped hand guard. Like the original Ames version they are modeled after, these handmade sabers include a real leather scabbard. They can be sharpened for an additional fee. 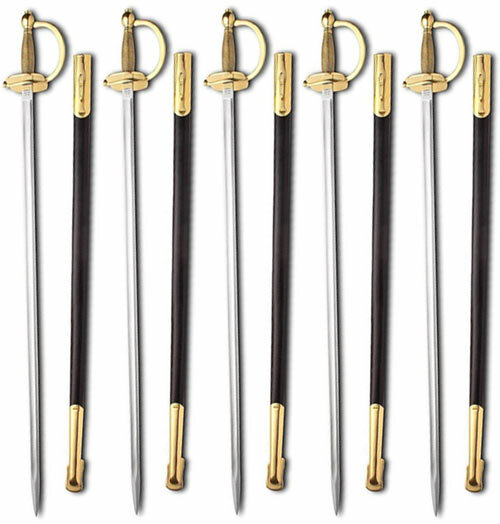 Buy these popular premium edition Ames NCO swords with a five pack discount for $724.95. Discount Specials for this Item in 5 Packs and 10 Packs.